Let the Kids Eat Sugar! My kids eat sugar. They have dessert most nights, and will sometimes choose sweets as snacks. They eat cookies and cake, sugary yogurts and breakfast foods, and yes, candy. They love candy. In our home, we follow Ellyn Satter’s Division of Responsibility with regard to feeding. That means I choose what they eat at meals and they choose what items they eat (from my selections), how much they eat, and if they eat at all. As Satter suggests, I serve dessert with dinner each night – as opposed to after – and sometimes offer sweets as snacks, when the boys are allowed to have as much as they’d like. This cotton candy was a snack, and they were allowed to go to town with it. It just so happens (as it often does with foods they enjoy) that their eyes were bigger than their bellies. I let my kids eat sugar because I want them to think that parties and beach days and movies are fun, and sweets enhance these experiences. I let my kids eat sugar because it makes them happy and I don’t want them to feel left out. I let my kids eat sugar because I don’t want them to think about sugar. I’d rather they use their brain space for something other than what they aren’t allowed to eat. And I let my kids each sugar because I don’t want them to have a lifelong struggle with sweets. 1) Sugar remains just sugar. Sugar won’t sparkle in the same way it will for kids who’ve had their sugar intake restricted or tied to their behavior. Sugar is not a reward. There’s no, “Eat your dinner and then you get dessert” mentality that is communicated to them. Sugar equals egg equals broccoli. When sugar is equivalent to all other food items, kids learn to eat intuitively. They’ll choose foods based on their taste, yes, but also based on how they make them feel and what they’re craving at that moment. They’ll be less likely to engage in emotional eating, using sweets to comfort or soothe. The restriction of any food sets it up to hold greater weight later on, when it might be selected out of deprivation, not preference or choice (see below). 2) Kids learn how to self-regulate. 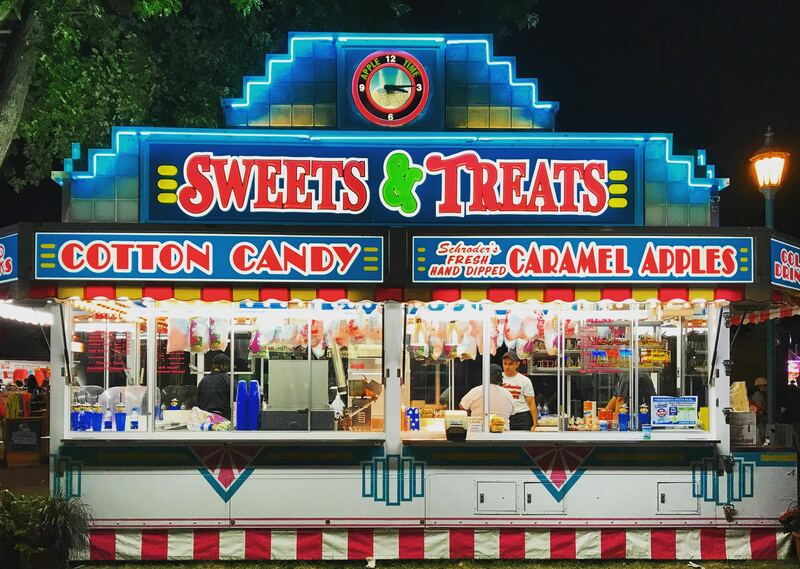 Which lesson do you think would have a stronger imprint – their mom telling them that they might not feel so well after a boatload of cotton candy or them experiencing this for themselves? It’s not that I want my children to feel pain, but experience has a powerful impact on learning, particularly helping us regulate our appetite and food choices and trusting our bodies to take care of themselves. When we restrict our children, they’re denied the opportunity to self-regulate and lose their innate sense of trust in their bodies. Is a super-size bag of Skittles too much for your little one? Probably. But they won’t know this is true unless they’ve had the experience of pushing the bag away half-eaten, owning, “I’ve had enough.” Or maybe they eat the entire bag. That’s grist for the mill, too, as they’re always gathering data on what works – and doesn’t -for their bodies. 3) Sugar isn’t the forbidden fruit. When kids eat sugar, this access reduces potentially problematic behaviors. They don’t go to birthday parties and overdo cake because it’s the only time they can or hoard chocolates under their beds. Access leads to safety and comfort. Restriction leads to anxiety and, typically, overeating (when there’s opportunity). Your efforts to control their intake will likely backfire, leading to disordered thoughts, feelings, and behaviors around sweets. Overeating, binge eating, and hoarding of sugary foods is common when they are restricted. 4) They’re unlikely to develop an addictive relationship to sugar. You’ve probably heard about sugar addiction. Actually, there doesn’t seem to be solid evidence to support this concept; the sugar addiction research makes some strong points in favor of eating sugar! The primary studies with sugar addiction used rats as subjects. The rats were deprived of sugar and then finally given access, at which point they overdid it. While children aren’t rats, there is something to this, as discussed above: deprivation leads to overdoing, which can sometimes look like addiction. For the rats that weren’t deprived of sugar initially, no sugar addiction was evidenced. And for parents concerned about the study in which rats demonstrated a preference for sweetness over cocaine, keep in mind that: a) Your children aren’t rats and b) While sugar will always be available in our children’s lives, cocaine doesn’t have to be. It’s much harder to restrict something that is a typical part of life (e.g., desserts, birthday cake, your caramel latte) than an illegal substance that we can avoid fairly easily. So even if our brains function similarly to rat brains, we need to find a way to work with these preferences rather than against them. It’s important to learn how to have a relationship with sweets given their existence in our day-to-day lives. We don’t need to have a relationship with cocaine. 5) We set them up to appreciate food socially/communally. Sugar is a part of life. When kids eat sugar, they develop a healthy relationship with sweets and learn to navigate social situations that include sugary foods in the future. They don’t have to avoid plans for fear that some off-limits food will be served. They can eat a popsicle at summer camp, go for ice cream with their soccer team, and trade candy at a movie with a friend. These are all normal and healthy ways of interacting with others around food. When kids eat sugar, they morph into grownups who have a healthy relationship with food. As adults, food fears won’t prevent them from missing dinners with friends, walking into the break room at work, or celebrating a special occasion with something sweet. *This post is intended for parents of children who do not have medical conditions that would necessitate monitoring of sugar intake, such as diabetes.